To check our actual offers in Johannesburg, please use the white form above. Just enter the desired dates, time and pick-up/return location. The most recent car booking in Johannesburg has been made on our website 4350 minutes ago.. In Johannesburg, we offer for rental 11+ car categories from 98+ rental suppliers. OrangeSmile provides one of the lowest rental prices on the worldwide market. You can save on your car hire in Johannesburg even more: (1) by renting your car purely at an airport with the pick-up/drop-off at daytime; (2) by keeping the pick-up and return at exactly the same rental location in Johannesburg; and (3) since rental prices in South Africa are computed based on 24-hour interval, try to match this period and return your car just before your last 24-hour period expires. Additional saving can be achieved by making your reservation few months in advance. Rental rates in Johannesburg increase as the rental date is approaching. To avoid financial risks in case of an accident or a theft in South Africa, we advise to order an insurance package with the full franchise coverage (Zero Excess). You can do it directly at the rental desk in Johannesburg, or during your booking time on our website. Before visiting your rental office, prepare all the required papers that are specified in your voucher, plus, a printed map of Johannesburg. Pile the documents together to act quickly at the rental desk during pick-up. Do not forget to examine the car conditions prior to leaving the rental parking in Johannesburg: wheels, windows and chassis for scratches and other defects. Check against your rental document whether all the defects are already specified. Rental offices in Johannesburg are sometimes strict on delays in car return, therefore, always try to bring the car back to the rental office at the specified time. Explore Johannesburg and South Africa to the maximum, having your rental car as your friend always near! 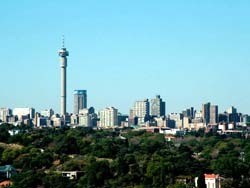 Johannesburg is one of the most populous cities in the country. The city has become home to representatives of different nationalities. Foreign tourists will be particularly interested in culture and lifestyle of the ethnic tribes. However, when dealing with the indigenous people, tourists should take into account a lot of important points. The locals have rather different approach to Europeans. Many of the natives simply prefer to avoid them and show their feelings quite openly. Others, however, can express increased interest and attention to foreigners. When communicating with the local residents tourists should not be aggressive. They need to be friendly and quite restrained. It also is not recommended to photograph the local people without their permission, as well as to try to enter someone’s home without invitation. If the local people do not feel any threat or aggression from the side of foreigners, they will behave in a very friendly and open manner. When it comes to clothes, there are no strict rules here. Classic and casual styles of clothes are very appropriate, but tourists shouldn’t wear khaki colored clothes. Wearing accessories, clothes and shoes in military style is simply not accepted here. Even children are not allowed to wear such outfits. Residents of the city usually prefer European style of clothes, but people in small tribal villages located in the outskirts of the city can wear national costumes and very specific headgear.